Lake Shore Cryotronics and Cascade Microtech announce today that the companies have entered into a cross-marketing agreement, a partnership that is designed to help guide customers to a cryogenic probe station that is best suited for their needs. Under the terms of this partnership, we have agreed to reference each other’s cryogenic probe station models when they are a better fit for a customer’s sample size and movability requirements. Both of our sales channels are cross-trained on the other’s platforms, and we will both work to ensure that customers are quickly guided to the best probe station for their needs—even when that solution is from the other company. This collaboration combines the knowledge of two industry leaders who operate in two distinct areas of the probe station market. Lake Shore, who specializes in precision measurement at very low cryogenic temperatures and in high magnetic fields, is a widely recognized international supplier of cryogenic probe stations for semiconductor and magnetic materials research and early stage device development. Cascade Microtech is a leading global supplier of automated probe stations for advanced semiconductor device development and production testing, with particular expertise in precision measurement at RF and higher frequencies. Lake Shore’s probe stations are for the earliest R&D phases, when you need to measure smaller and fewer samples at variable temperature and in magnetic field. Lake Shore’s cryogenic probe stations are used in the earliest phases of new semiconductor and magnetic materials R&D. Our platform features align with the limited size and number of samples being measured, as well as the need to probe at the lowest possible temperatures (below 10 K) and within high magnetic fields (often over 2 T). Sample stages are generally fixed in position. 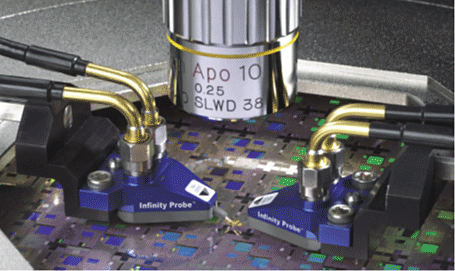 Cascade Microtech’s probe stations are focused on the next phases of device development where multiple copies of devices have now been constructed. 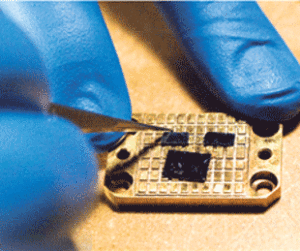 Their platform features align with the larger wafer size and number of devices, as well as the need to replicate measurements across those many devices. Sample stages are moveable in a semi- or fully automated fashion. 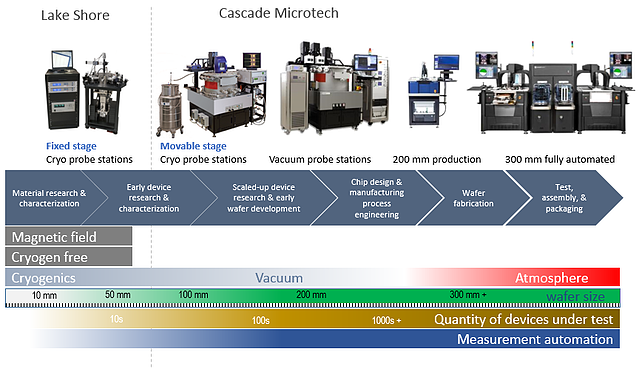 Cascade Microtech’s stations are for later phases of device development, when you need to measure full wafers and may need to repeatedly measure multiple devices. Cross-marketing will soon be seen at industry trade shows and in each company’s promotional materials. Also, as part of this collaboration, Lake Shore is now a recognized partner under Cascade Microtech’s MeasureOne program, which strives for superior customer measurements by ensuring alignment of complementary partner technologies. This partnership also sets up potential joint-development programs between Lake Shore and Cascade Microtech, specifically when the best solution for the customer requires a combining of expertise and design assets. The goal is to provide customers with validated cryogenic probe station measurement solutions, resulting in the highest levels of confidence in both performance and reliability. For more information and to discuss which probing platform would best suit your research application, contact sales@lakeshore.com.